Since its inception 26 years ago, the "Théâtre du Petit Miroir"has performed in sixty five countries on all the Continents in French, English, Chinese, Malay, Bishlama, Samoan and Indonesian. It was the first French puppet show invited to perform in China after the Cultural Revolution in April 1981. Encouraged by Master Li Tienlu in the use of Chinese Puppet technique in non-eastern contexts, Jean-Luc Penso has, since 1985, expanded the repertoire of the company to include works from the European tradition that have performed in Greece, at numerous venues in France, throughout the Mediterranean, in the Middle East, in East-Africa and Asia. 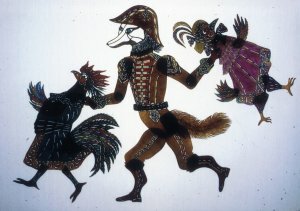 Shadows play: In 1990, the company began to work on a different type of show : the Theatre of shadow puppets. A Taiwanese master taught this technique to the artists. The first production of this type is "The Third Prince". It has since been performed numerous times in France, including the Avignon Festival, at Reunion Island as well as in Spain, Singapore and Taiwan, China, Hong Kong and Macao. What were your first interests in theatre? Tell us about your background in the arts. My background is mainly the five years with master Li Tien Lu. I worked for many years in theatre and circus in France as stage technician. How have you incorporated your European sensibilities into the Oriental art of shadow puppetry that you perform? I have been educated in Chinese theatre and I belong to a western country. So the creation between the 2 cultures has never been a problem but a great experience. Have you evolved any new innovations in sound, lighting, and staging to complement the virtuoso techniques of your teachers? Yes, definitely with the strong support of my master. ‘Théâtre du Petit Miroir’ has been performing for 26 years in over 65 countries, including the Mediterranean, the Middle East, East-Africa and Asia. Which has been the most memorable and why? Every performance is a new experience and I have memorable souvenirs from everywhere. The most important one was the first time I played my new creation in Taiwan in front of my Master. How does one join ‘Théâtre du Petit Miroir’ – do you apprentice new artistes? Are youngsters interested in your art? Every body is welcome. I teach at the International institute of Puppetry in Charleville Mézière and I have some apprentice in Paris. 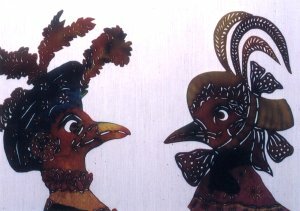 Are you aware of the traditions of shadow puppetry that exist in India? Would you be interacting with our puppet theatre artistes? Of course, I know about the tradition of puppets and shadow play in India witch is so rich in all arts. To tell the truth, one of my dreams is to create a Ramayana with Indian artists. I think that crossover work can bring more knowledge between people. What do you think about that? A short description of ‘A fox story’ that you intend to perform at The Park’s THE OTHER FESTIVAL in Chennai. The fox story is so well known that we study it at school, it is a part of the French tradition, through its story I shall try to introduce a small part of the French touch!